It's the best hostel I've ever stayed in. Great location, warm staff and well maintained facility. Every morning, there'll be freshly baked pastries done by the cleaner. 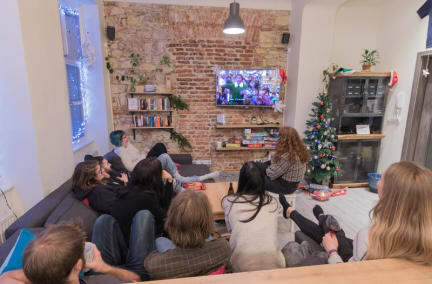 It's a small size hostel so you'll be able to meet and bond with guests alike. Every night, staff will arrange dinner for everyone to share and make sure guest are entertained every night. They provide affordable laundry service also. I would definitely recommend this to all travelers. Love Roadhouse Prague! This was my first time staying in a hostel, which is unfortunate because I doubt any where else will live up to the standard set by the Roadhouse. Everything was wonderful - super friendly staff, excellent facilities (great bathrooms, comfy beds, excellent Wifi), communal dinners and evening activities, perfect location. I can't recommend this hostel enough - I want to come back to Prague just to stay here again. The best hostel ever in my life, seriously. The bathroom is like hotel standard. milk and eggs and other things are provided all days, free of charge! Staff are super friendly and helpful with everything! Nothing u can complain at all!!! And I am not joking! This is one of the best hostels I've ever stayed at! The location, cleanliness, value, etc. are all there, but what sets this place apart are the staff. The staff actually hang out with you and take you out, cook and eat dinner with you - in short you make a lot of friends. A special shout out to Dave, Jenny, Havard, Jose, and Rod for making the experience especially memorable. Thank you guys so much! Definitely where I'll stay when I return to Prague. I don’t think words can do this place justice...it was absolutely amazing!! Gave a very thorough rundown of Prague upon arrival to get you situated....family meal every night and than planned activities! Very social hostel, but by no means a party hostel! Perfect! 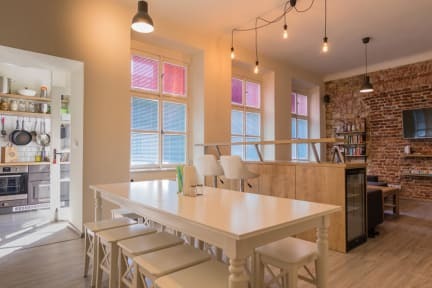 One of the best hostels I've stayed in - I would definitely recommend if you're headed to Prague. It was very friendly and homey, clean and comfortable, amazing staff, and better showers than I have at home. Easy walking distance to anywhere you'll want to go. The hostel was in a great location near Charles Bridge and within walking distance from other important places! The staff was nice and tried really hard to get guests engaged with nightly dinners, pub crawls etc. I like to keep to myself and feel that I was given the freedom to do that as well. I wasn’t a fan of co-ed rooms or the bed linens (just a duvet) but overall I care most about location and cleanliness and I have no complaints in either of those departments.